RAGETRADES! 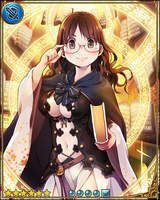 YOUR SOURCE FOR RAGE of BAHAMUT INFO, HELP and TRADES: Mina the New Invite Card! Mina the New Invite Card! The New Invite Card is here! Finally an invite card that actually is worth chasing! So 24 Hours after release this card is in high demand! I have seen her go for as low as 7hp and as high as 20hp during this time frame. Get it as cheap as you can now before people start realizing you create more than a 19 card evo. Below is the information I know at this point. Please fill in the blanks if you can. So it takes a minimum of 19 cards to equal this card's straight evo FF. Please ignore any comments posted by users asking for your username or password saying their affiliated with cygames. If this continues the site will go back to admin approved comments only. Which takes around 24hrs for your comments to show up. After reading this though, sounds to me like a straight evo with unevo'd Minas is the only reasonable way to go! I guess doing a 36 evo wouldn't be out of the question though...two 18s and then evoing them together. It would probably be a pretty reasonable increase right? Awesome let us know how she turns out. I still think using 36 would be best. It's like the difference between a 4 card evo and a 6 card evo. 36 is a lot more than 19, but it's certainly within reason. Does anyone even know what the final ATT/DEF would be in a perfect Grimoire? Enchanting it now will update when done. Awesome Tyler! This is what I'm really interested in. it is a very heated debate! also to max evolve it would be about 44 years. Don't you think any # cards higher than 36 would be better? My Mana Reader Mina +6 is only at 3751/2551 and that's with using about 27 cards. Had her at first final form then created another first final form, then combined. I didn't see a huge difference. From there, I was running out of Mina's and did something else (which I forgot). I don't know that she'll all that much trouble at being Perfect, yet having at least 2 19 evolved Mina's in your deck. This is correct, just finished mine. I would love to know what an evo down to the next tier would be. In other words, four Minas evolved to the 17th level and then evo'd together (68 total). How much of an increase from a 36 evo would it be? I wanna ask..im a new user for this game, and i wanna ask about the meaning of "hp".. ive heard u all wanna trade cards for certain amount of hp. What is hp actually? I know xlrome that the comment was for Zuks; however, I believe it takes a minimum of 19 cards to get the 13k. Adding more cards like I did really didn't amount to much more in attack. Umm Vincent, Thanks but your not answering my question. "How do you properly evo mina?" is my question. Literally.. is it just adding mina's back to back 19 in a row? or is it like a 6-10 evo? I would appreciate it if someone would explain in detail. It's just what you said...evo them back to back. Pretty easy. Yes. Evolve 6 School Girl Mina's back to back (1 School Girl as the Evolver card) to get Skull Summoner Mina. Evolve into Skull Summoner Mina another 5 School Girl Mina's to get Mana Reader Mina. 11 Mina's used. Evolve into Mana Reader Mina another 8 School Girl Mina's to get Grimoire Mina. 19 used. From there, max enhance to get to 13k ATK and 8k DEF. Thank You Vincent!! I understand now. I really appreciate you taking the time out to post it. Incredible information here guys! Thank you! So, I have been evo'ing by School Girl Mina's like I evo any other card; (base) + (base), (base+) + (base+), and so on. From what I've read, I'm I safe in assuming that I'm completely mis-evolving my Mina's? @Johnny Cage: If you're just going for a simple 13k ATK Grimoire Mina, yeah. Doing it the way your are may eventually get you to a Perfect Grimoire Mina, but it'll take a ton of cards. If you have the time and the resources, stick with it. I did a 31 card and gave up. Mina's at 13k are loosing value atm selling for 50-60HP max. So, what you put into the card you may never recover; however, if you can get to a Perfect, you'll definitely make tons off of it at 27k. Good luck. I'd like to see it personally. If you saw Elamb98 used a ton of cards and still ended up with 13266 atk. I just calculated the amount of cards and it would take approx. 262,144 cards to make a Perfect Grimoire Mina at 27k. WOW!!! That's completely ridiculous! Real nice, Mobage. Thanks for giving us a card that is impossible to complete. So I'm guessing it would be who of me to simply evo what I have with base School Girl Mina's from now on? Jonny, if I were you I'd put it up for sale on the boards man. Let someone else take over. You put too much into it to simply evo it up. I'll see what I can do until trades resume. I probably will sell it eventually. Thanks for all the help guys! Yeah Jonny. idk. Given that calculation and that they're are approx. 3mil user's, that only allows up to 11 Perfect Mina's in the market. Of course, if there's more than 3mil accounts at level 10, it could be slightly more.